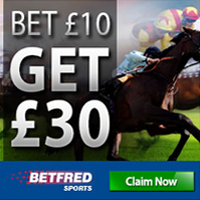 For more promotions check our BetFred promotion page. Betfred offers a lot of tournaments and freerolls that are all worth a fortune. It also provides popular classic casino and poker games such as Hold’em, Five-Card Stud, Omaha-Hi, and Hi-Lo. Even though the brand does not accept gamers from the US, the traffic in the site is great and the services offered are unmatched. Besides poker and casino games, Betfred is also a home for sports betting with great promotions attached to every category in which you may wish to take part. When you visit the Bet Fred.com website, you will be greeted by live horse racing, soccer and football games where you can stake your money and win big with the various fixtures. he freshly refurbished and reliable BetFred software anchors all the services any poker gamer visiting the site may need. It brags of a crisp, modern look, not to mention the great functionality offered to their esteemed poker and sports betting fans. The software is quite user-friendly and can be directly navigated to get the game or service you need. The Betfred lobby allows quick access to games based on their various poker categories. The blue theme color choice and tabs are just perfect for clients because they aren’t too distracting as witnessed in other casinos. You can now reach the VIP lobby quickly to check your status, bonuses and active services. A tweak on the favorites tab now allows you to save your frequently played poker games such that you can always begin from where you left off. Also, the availability of BetFred website has now been optimized for a mobile version through which gamers can access the BetFred services on the go. After signing up, log in through the mobile version and scoop the sign up offer provided. It is available on iPhone, iPad, Android and tablets from where you can access all the Betfred cash table games. Betfred values their customers and shows that by offering the greatest promotions and bonuses as outlined in this section. The first reward is the sign up offer where all the new players are awarded a free £10 bonus in tournaments as well as side game tickets for a minimum deposit of £5. You can also join the Betfred casino club from where you can walk away with a monthly prize of £2000. To enter the promotion, you are required to stake £50 on one of the selected weekly slots to be awarded the £500 ticket to the final draw. Besides the attractive sign up offer, there is also a 200% first deposit bonus for up to £1200 for which every gamer is eligible. To claim the bonus, you have to download the Betfred poker and deposit your first amount. After that, visit the live help section on the top toolbar of Bet Fred.com and type POKERWELCOMEBONUS1200/150 in the Chat room with one of the agents. Betfred also has special dedicated bonuses for the mobile users which are £25 free spins as well as a £5 deposit bonus whose promo code is WELCOME10. For more details check the latest bonus on our BetFred bonus page here. Betfred offers an array of heads-up and Sit 'n' Go tournaments which are available during the weekdays and another edition for the weekends. You can engage in Texas Hold’em, Omaha Hi or Lo in fixed limit or limit tournaments. Pot limit and no limit games are also available where the latter is regarded as the highest craft in the poker games. If you have the guts, tactics and some amount of luck, then you can take part in that tournament to win big. Betfred also offers many freerolls on a regular basis with no entry fees. Here you have the chance to compare your skills to over a thousand players. Get a chance to win £9000 issued in freerolls every month with the £1000 VIP freeroll that goes down on the final Sunday of the month. There is a draw on all the cash games occurring at 7-9pm where you can get double awards for every win. The super league is an opportunity to participate in the £2000 worth grand final from an entry deposit of £1.10. Once you sign up at Betfred, you have the chance to win freerolls every Tuesday and Thursdays. Other offers include the daily and weekly magic, casino side games such as Blackjack, Roulette, and lucrative slots. Betfred runs on one of the most stable networks in the UK gambling market. It has gained much ground despite the drawback of being banned for US players. It has instead become popular especially among the Ireland audience where cash gambling is legal in many parts of the country. It ranks fourth in the UK market and among the best in sports betting sites. BetFred has a very responsive customer support system that is available seven days a week through telephone, email and live chat. Compared to other online poker sites, it is among the top. As seen in this BetFred Poker review, it is the poker room to join primarily due to the high-value promotions, the sign up offer, and their fantastic game selection.